The common cold, caused by a viral infection of the upper respiratory tract, is something we all have to deal with from time to time. We’ve all suffered through the inflammation, sneezing, coughing, congestion, fevers, sore throats, and excess of mucous that come with it. But did you know that one of the best treatments for a common cold is an equally common soup? Chicken soup isn’t just a soothing comfort food. When made with the right ingredients, it can actually help cure the common cold. You’re about to learn 10 different chicken soup recipes you can try out as a home remedy next time you get a cold. First, let’s take a look at why it works. What Makes Chicken Soup Good For Cold? Certain ingredients are naturally anti-inflammatory. They inhibit the movements of neutrophils—immune system cells that participate in the body’s inflammatory response to the bacteria that cause a cold. This reduces some of the cold’s side effects. Certain ingredients increase the flow of mucus, reducing the amount of time viruses remain in contact with the nose lining and relieving congestion. Chicken soup contains cysteines which thin mucous. Because chicken soup is liquid, the body absorbs easily all the nutrients and minerals it provides. Chicken soup soothes and moistens a sore throat, reducing irritation, pain, and coughing. In a large soup pan, cook chicken chunks and garlic in 1 teaspoon of olive oil. When no pink remains in the chicken, add broth, bring to a boil. Reduce heat and cover partially and simmer 20 minutes. Use tongs to transfer the chicken to large bowl. Now discard the bones from chicken and cut the chicken into small pieces. Add a spoon of fat on the top of the chicken broth and return it to simmer. Add onions, carrots, celery, and thyme, and let cook until soft. Stir in noodles or rice and simmer until done. Ladle into a bowl, garnish with parsley, and eat. Add chicken, onions, and garlic and cook 5 minutes or until onions are translucent. Add water, white wine, and lemon juice, bring to a boil, then reduce to simmer. Add ginger, peppercorns, chicken bouillon, bay leaves, and white sugar. Add carrots, celery, kohlrabi, rosemary, and thyme. Reduce heat to low, add noodles or rice, and cook 15-20 minutes or until noodles are done. Season with salt to taste, garnish with parsley, and eat. Pour broth into large soup pot and bring to a boil. Add carrots, celery, ginger, and garlic. Add chicken, 1 teaspoon of salt, and ¾ cups of water to frying pan, and simmer until chicken is cooked through. Add noodles and cooked chicken to broth and simmer 8-10 minutes or until noodles are soft. Add dill and lemon juice and simmer 2 more minutes. Remove from heat, ladle into bowl, and eat. In a large soup pot, over medium heat, cook leeks in olive oil until they’re soft (about 3 minutes). Add sage and cook until fragrant (about 30 seconds). Add chicken and beans, reduce heat, and simmer 20 minutes. Have this soup hot regularly to get relief from cold. In a large soup pot, heat olive oil over medium flame. Add zucchini, shallot, Italian seasoning, and salt, and cook for 3-5 minutes or until vegetables are soft. Add tomatoes, broth, wine, and orzo and bring to a boil. Reduce heat and simmer 10 minutes or until noodles are cooked. Add spinach and cooked chicken and cook 3-5 minutes. Let cool to a comfortable temperature and eat. In a large soup pot, bring 10 cups water to a boil. Add chicken, celery, onion, carrot, peppercorns, parsley, thyme, basil, and bay leaf. Reduce heat and simmer 2 ½ hours. In a frying pan, heat olive oil over medium flame. Add chicken livers and saute 2-3 minutes or until no pink remains. Strain chicken livers and add juices to a soup pot. Add tomatoes, pasta, and salt and pepper to taste, and simmer until noodles are soft. Ladle into bowl and eat. In a large soup pot, bring 10 cups of water to a boil. Add chicken, carrots, onions, and salt, reduce heat and simmer 1 hour. Move chicken to a plate and strain out carrots and onions. Add rice and simmer 15 minutes or until rice is done. Add chicken and pepper to soup pot and simmer 3 more minutes. Scoop avocado into a bowl and pour soup over it. Squeeze juice of ½ a lime into the bowl of soup and garnish with cilantro. Have this soup regularly to get rid of the cold and flu. Add garlic and ginger and cook until fragrant. Add chicken and cook until no pink remains. Add broth, soy sauce, chili sauce, salt and pepper, and bring to a boil. Stir in scallions and noodles and simmer 15 minutes or until noodles are soft. Ladle soup into bowl and top with spinach and chili garlic sauce. Chicken broth is very easy for a baby’s body to absorb. It contains many vitamins and minerals, and gelatin, which strengthens skin, bones, connective tissues, and cartilage and aids in proper digestion. Place chicken and vegetables in a large soup pot, cover with water and bring to a boil. Add vinegar to extract calcium from chicken bones. Reduce heat and simmer 8 hours. 20 minutes before the end of 8 hours, add parsley. Remove chicken from the pan and remove the meat from the bones. Feed the broth to your baby when she gets a cold. Save chicken and vegetables to add to soup for adults. Add all ingredients to soup pot and bring to boil. Reduce heat a let simmer 1 hour. Turn off heat and let cool 15 minutes. Once cooled, transfer all ingredients into food processor and puree. Feed to your baby whenever he gets a cold. 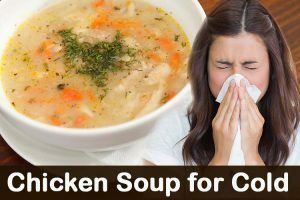 Have you tried any of these chicken soup recipes for treating the common cold? Which ones did you like best? Share your experience with us!